The XCLIO 320 supports 6 optional fans and water cooling system for seamless cooling customization. To meet your extensive graphics processing demands, the XCLIO 320 offers sufficient space to support up to 340mm graphics card. Grab a valued case without breaking the bank. Excellent Cooling Solution For upgraded cooling, the XCLIO 320 also supports water cooling and 6 optional fans (1 x 12cm front fan, 2 x 12cm/14cm top fans, 2 x 12cm/14cm side fans and 1 x 12cm bottom fan). Long graphics card support The XCLIO 320 supports high end graphics card with length up to 340mm. 7.68" x 17.4" x 20"
Pros: decent case for the price. Other Thoughts: Never though my thumb was that powerful compare to horsepower of the PC. Cons: It is cheap metal but for the price what did you expect. Pros: really good quality. ! Pros: -it's really big so it has plenty of room for any card any heatsink and you could probably even mount a radiator on the top on the inside depending on your motherboard. -The black paint looks nice and the design is nice and simple... not like some alien space ship. Other Thoughts: I can't believe this case is so cheap. I've had it 6 months and it still amazes me. I'll probably be keeping this case for pretty much every future build. 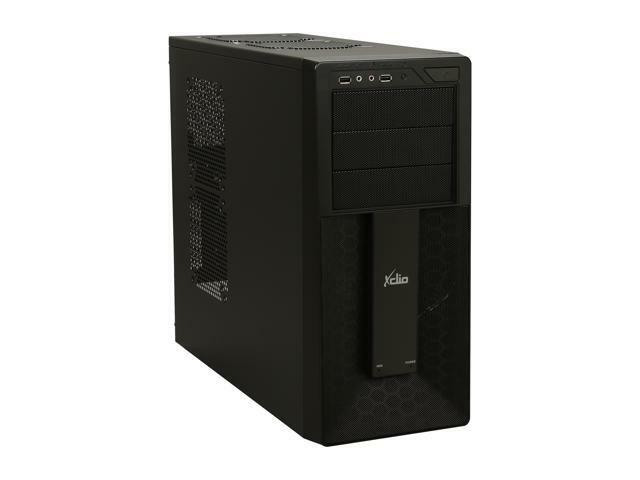 Pros: Larger case with cable management features usually found in cases costing $60 and up. Very roomy inside With many cooling options...case fans, water cooling cutouts, etc. Very solid build for this price rnge, almost no flexing of the case. Fit and finish are excellent. I like the blue LED HDD activity light better than I like the red ones, much easier on my eyes. Inside is roomy and well laid out. Very happy with this case at this price point.